To honor some of these outstanding innovators, iHub gave out several awards this year at a celebration of its fifth birthday, including its inaugural “Disrupting Medicine” award. The recipient or recipients of this award will embody the characteristics of the innovators that inspired the creation of iHub in 2013. Innovators who have the passion to enable change, the courage to pursue high reward in the face of high risk, the creativity to get the job done, and the ability to make innovation accessible to all. Lesley Solomon, MBA, founding Executive Director at iHub was selected to receive this award in its first year. Solomon, now chief innovation officer at Dana-Farber Cancer Institute needs no introduction to those in the digital health community. She has had an amazing career that has included helping two small, obscure startups, transform into Barnes and Noble and the Food Network. After these successes, she worked for nearly a decade with the Brigham family. Solomon’s energy, creativity, matchmaking skills and almost magical ability to pull ideas out of people, are the necessary elements of any innovator who wants to change or impact the health care system. Thanks to Solomon, iHub coined the phrase “What are you innovating today?” – providing a welcoming environment to any and all who have an idea that will move this institution and health care forward. 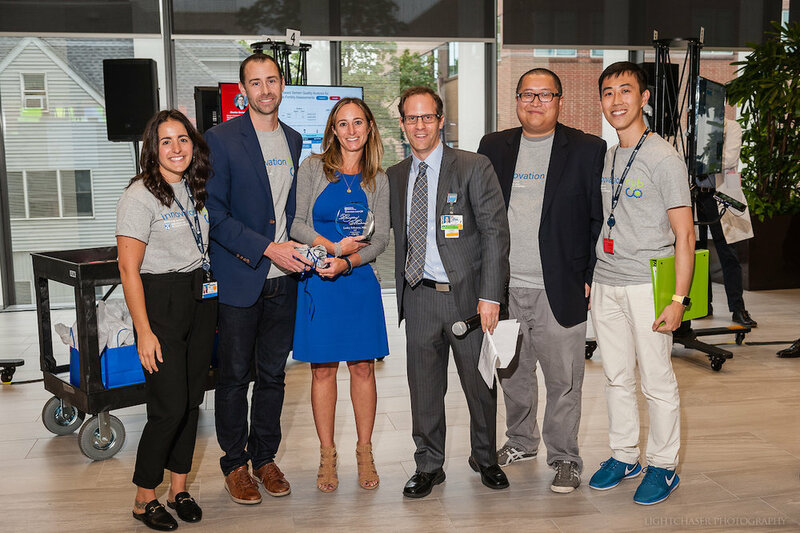 Brigham Digital Innovation Hub team with “Disrupting Medicine” award winner Lesley Solomon, MBA and Brigham Health CIO, Adam Landman, MD: Lightchaser Photography / J. Kiely Jr.
Want to learn more about some our amazing innovators from over the years? Chris Williams, PhD and iHub’s Cassandra Lee: Lightchaser Photography / J. Kiely Jr. Nominees for this award were selected from among some of the most innovative duos within our system. Some of them are close collaborators and friends, and some are even members of the same family. Collaboration and support from other innovative peers within your circle can be the secret sauce to innovation. This year’s winners were Konstantin Kovtun, MD and Chris Williams, PhD, best known for their work applying virtual reality to the field of radiation oncology with RadOnc. “Working with Kos has been a fantastic experience. Our project explores the emerging role of VR technologies in medicine, and it has drawn on our complementary backgrounds and skill sets. Our collaboration has not only enabled us to get this project off the ground, but has also made it especially fun to work on", said Williams. Champion of Champion’s Winner Paul Riley with iHub Team Members and Brigham Health CIO, Adam Landman, MD: Lightchaser Photography / J. Kiely Jr.
Decided on through a public vote, this year’s digital health community prediction of the company that was most likely to become a unicorn was Orbita, Inc. This company built a platform that powers voice and chat bot applications for health care. You can learn more about Orbita and other voice technology initiatives in the space at this year’s Voice.Health Summit, hosted by Boston Children’s Hospital. Over the past five years, we have learned the value of clinical and administrative champions – those who find resources, go to bat among competing priorities and do whatever it takes to get an initiative over the line. This year’s highlighted champions were Bruce Levy, MD, chief of Pulmonary and Critical Care; as well as Paul Riley, director of Perioperative Business Services in the BWFH Operating Room. Levy has championed many projects including iHub’s first customer in our departmental innovation series days. Riley recently helped iHub implement Torq Interface in the BWFH OR, and is also the earliest adopter of a startup on our new integration platform, Redox. Brainspec Founder, Alex Lin, PhD and iHub’s Cassandra Lee: Lightchaser Photography / J. Kiely Jr.
Julianne Soriano, of MGH HTL, and iHub’s Cassandra Lee: Lightchaser Photography / J. Kiely Jr. The Dinner’s On Me award goes to the project which has raised the most funding since working with iHub. Brainspec, which uses magnetic resonance spectroscopy to generate a “virtual biopsy,” won one of iHub’s first departmental innovation series, and went out to spin out a company. Since then they have participated in Phillip’s Healthworks accelerator, Techstars, won the Google Cloud machine learning pitch-off, and have raised $1.8M. The concept and research for Brainspec is based on Alex Lin, PhD research who is a world-renowned leader in MRSpectroscopy. Brian Hasselfeld, MD with iHub Team Members: Lightchaser Photography / J. Kiely Jr. The Celebrity award goes to the project which has received the most media coverage and recognition since working with iHub. Hadi Shaifee, PhD, is this year’s winner. His work in microfluids and point-of-care male fertility analysis using a smartphone app and attachment was covered by more than 160 news outlets, including CNN, NPR, Scientific American, CBS, and the Verge. For reference, the Altmetric score for his paper, which is the gold standard used to measure media attention, was in the top 5% of all research outputs scored. 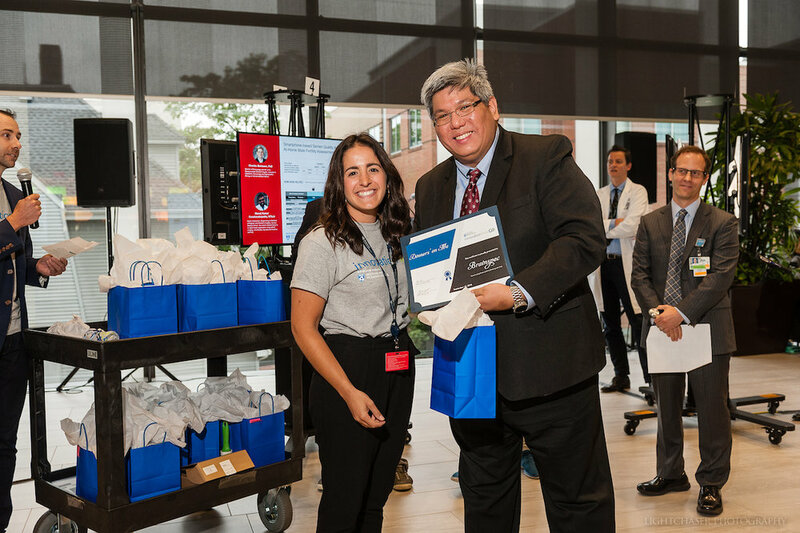 This year’s winner, Julianne Soriano, senior operations manager at the Healthcare Transformation Lab at MGH, has led many initiatives to collaborate between our teams. At iHub, we believe leveraging the knowledge and expertise from both Partners institutions will be one of the most promising ways for us to stay a leader in the space and move ideas forward. For the last three years, iHub has welcomed Brigham residents to a two-week elective rotation during their training here at BWH. We’ve had over 30 residents from various specialties come through our program to learn about and get first-hand experience in the world of digital health innovation. Through this program, we created an iHub Resident Board, led by this year’s winner Brian Hasselfeld, MD. Herald Health’s Andrew Hillis, PhD with Cassandra Lee and Brigham Health CIO, Adam Landman, MD: Lightchaser Photography / J. Kiely Jr. The Willful Suspension of Disbelief award demonstrates the importance of an iHub principle which we believe is core to fostering a culture of innovation, the foundation of all our work. As a resident on elective once described it, iHub is the place where you can find “willful suspension of disbelief for a given period of time.” Anyone within the Brigham family can come to the iHub Open Innovation Studio and talk about an idea for at least 30 minutes and we won’t say “no” right away. With this open-door policy, early-stage opportunities can take flight. 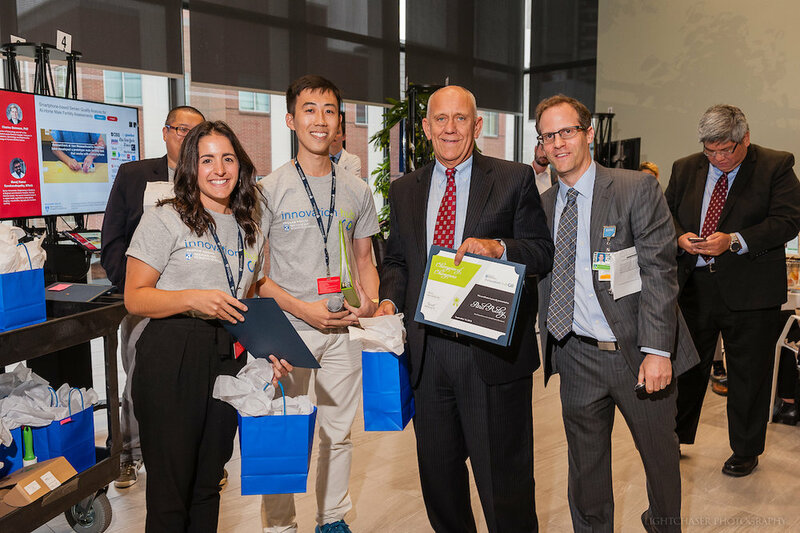 This year’s winning project, Herald Health, led by former Brigham Internal Medicine residents who brought their idea to use technology to provide high-yield, customizable, real-time decision support to providers to our third Hackathon in 2015. From there, co-founder Brad Diephuis, MD, and his team formed a company, were introduced to senior hospital leaders, Chuck Morris, MD, Kathryn Britton, MD, and Karl Laskowski, MD, piloted the product in collaboration with the Brigham Care Redesign Incubator Startup Program (BCRISP), and signed a vendor contract. This past summer, Herald Health was acquired by Persistent Systems. Members of iHub Team, BWH AV Team and Brigham Health CIO, Adam Landman, MD: Lightchaser Photography / J. Kiely Jr. Looking back and celebrating five years of our amazing innovator community, we couldn’t have supported these accomplishments and iHub’s overall growth without the help of some essential teams. With their help, we’ve been able to support individual projects, technical integration, events and collaboration agreements to make it all happen. Over the last five years, iHub has hosted dozens of hackathons, idea labs, digital research forums, speaker series and large symposiums. These events, bringing in thousands of attendees, have helped us succeed in one of our main missions, creating an excitement and culture around digital health innovation. These events and sessions would not have been possible without this year’s winner: the Brigham and Women’s Hospital Audio Visual Team.